Introductory note from NSS President Alice M. Hoffman, PE: NSS is seeking sponsors and judges for the debates described below at ISDC 2019 on June 6-9 in Washington DC. Check out the video our volunteers produced below, and contact me at [email protected] if you’d like to learn about sponsorship opportunities or judging. The Universalization Student Debate was hosted by the NSS at its annual conference and focused on the question of ‘whether universalization can promote global peace through cooperation’. 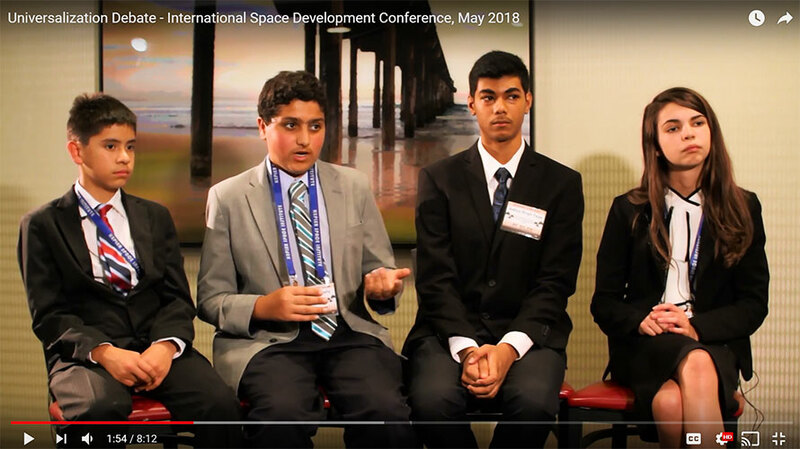 During the course of the debate, the student teams, ages 12 to 14, discussed the future of space governance, the sustainability of humanity through cooperation, and the nature of space as the next frontier. You can see the NSS Universalization Student Debate video below. Universalization is a term recently defined by international development and globalization researchers as referring to “the understanding of planet earth as one world within the universe and the imperative to approach development and sustain peace through cooperation,” says Dr. Edmonds. It leverages the value of space for building human bonds world-wide through the universal policy agenda espoused by the United Nations (UN) Sustainable Development Goals. The UN advocates for development that embraces global diversity with an inclusive – all of us – agenda. For Dr. Edmonds, the ISDC debate is one-step closer to considering many of the questions raised by universalization, but there is more work to be done. In the works for the fall by the NSS SpaceEdge Academy team and Dr. Edmonds are plans to hold the debate again next year at ISDC in Washington, DC and to launch a research paper competition. Those interested may email [email protected] for more information or visit the SpaceEdge Academy website. I believe the winning team had a great composition.